Ship at Launch on the corner of the Quay and Bath Street, where the spa was sited. 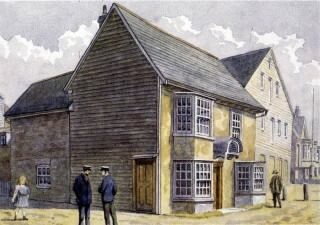 This short article describes Wivenhoe’s importance in the middle eighteenth century as the chief customs port for a large part of the Essex coastline where the revenue cutters were stationed. It refers to Horace Flack, the local surgeon, who was called upon to attend three of the crew of Captain Roger Martin’s smack ‘Wivenhoe’, which had been chartered to the customs authorities as a revenue cutter and had been involved in a fight with a gang of smugglers. It describes how he came to set up a sea bathing establishment at Wivenhoe which became so popular that he took on an assistant – Thomas Tunmer who took over the baths on the death of Flack in 1756. In 1762 Tunmer started to branch out and advertised ‘inoculation’ against the smallpox and later attended a course in midwifery so that he could attend ‘all poor women gratis’ for the first year. In 1772 he published a small book on the delights of sea-bathing and in particular in the ‘particular saponaceous and balsamic Qualities of Wivenhoe water.’ He describes himself as a ‘Surgeon and Apothecary at Wivenhoe, and Master of the Baths’. He recommends the sea passage from London to Colchester which was then run by a regular packet and extols the virtue of Wivenhoe water for jaundice, impetigo, and other skin complaints and hysterical disorders. He describes a formidable list of patients including the Sutton family, in particular Daniel Sutton’s son (the Suttons were a medical family), who became a notorious smuggler and kept his boat at Wivenhoe right under the noses of the Customs officers.